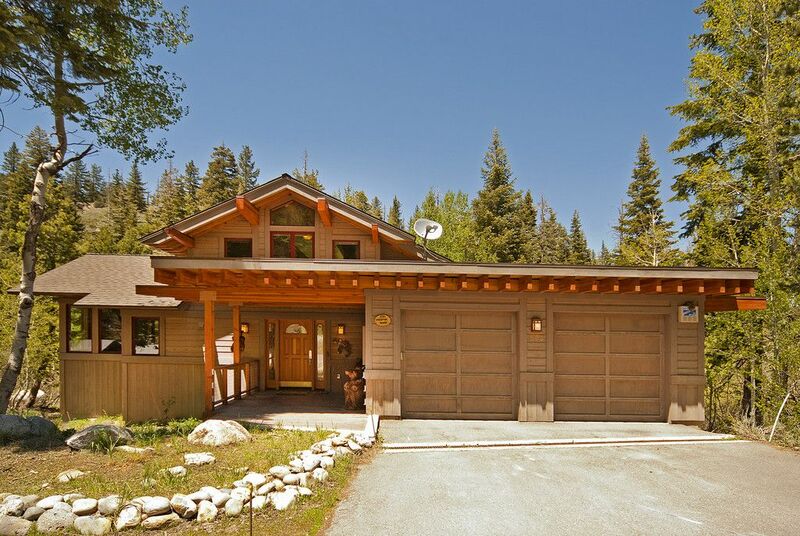 Custom built in 2002 for the English Lord of Norcott, this Tahoe vacation home has all the amenities you could desire in an Alpine ski resort. Upon entry to this magnificent vacation house, you are welcomed in the great room, styled for comfort with its stone fireplace, cathedral ceiling, home theater system and large windows. The open plan flows through the dining room to the well appointed kitchen, (including two dishwashers), with breakfast bar. The dining room is perfect for memorable family dinners with its large table that comfortably seats twelve. Each of the four master suites (one of which is an open loft style over the main living space) includes a king bed, attached bathroom, views of the river, satellite TV and high speed internet access. The sunny decks, gas BBQ and hot tub can be enjoyed within a lushly landscaped setting, with the soothing sound of the river creating the ultimate sense of relaxation. In the summer, Alpine Meadows offers a relaxed and peaceful refuge amongst sweeping valley views, meandering creeks, and hidden alpine lakes. The more adventurous can find their fix with some of the best hiking, horseback riding, and epic mountain biking around. When you're ready for a day at the lake or a night out on the town, sandy beaches and the Tahoe City boardwalk are just ten minutes from your door. 1. This property only has parking for four vehicles Nov 1 - May 1. There is NO overflow parking, and vehicles parked in neighboring driveways will be towed. 2. Fifth bedroom is technically a loft. 3. Internet service in Alpine Meadows (satellite provider) is known to be slow compared to urban standards, especially in bad weather. Refunds will not be issued for internet service interruptions. 4. Creek Side at Alpine is located in an exceptionally quiet neighborhood. Noisy or disruptive behavior will not be tolerated by neighbors or Tahoe Getaways. ​​​​​​​* All of our homes feature a full kitchen, washer and dryer, outdoor grill, and wireless internet (any exceptions will be noted in above). We are a local, upscale, professional property management company. For over 17 years, we have been the consistent and trustworthy source for private home rentals in Lake Tahoe and Truckee. All of us in the office live, work, and play the Tahoe lifestyle, and our team of Vacation Specialists are excited to share their local knowledge and help make your Tahoe vacation unforgettable. Vacation time is valuable. Don't trust an amateur. Tahoe Getaways™ provides a service level that cannot be matched by an individual owner. From crippling blizzards to late night home failures, we've been there and are prepared accordingly. We personally prepare each home for your arrival to ensure a welcoming and seamless experience. And while we never anticipate unexpected issues during your stay, we are available 24/7/365 to respond to any emergencies, so you can rest easy during your vacation. We look forward to welcoming you to beautiful Lake Tahoe! As a veteran of the vacation rental industry, Tahoe Getaways™ represents only the best in upscale Lake Tahoe and Truckee homes. All our properties feature a full kitchen, washer and dryer, wireless internet, gas grill, and of course exclusive access of the entire home. All of our homes are vetted to standard; professionally cared for year-round, so you can book with confidence knowing you will arrive to a clean and well-appointed property. Located in one of the most beautiful communities in the country, this home serves as your base camp for a wide range of outdoor recreation and sightseeing opportunities. Climb to the top of mountain peaks for incredible vistas, ski or ride at some of the top resorts in North America, or take a boat out on the iconic Lake Tahoe. Whatever you seek on your vacation, we at Tahoe Getaways™ can help make it happen. Queen size air mattress and linen provided. Beautiful place to stay.Clean. Fresh. Great views from the rooms. Access to creek was the best for us. Also close 10 minute drive to grocery store. Excellent, will rent the same place again. Such a lovely time on the creek at Alpine!! Our group had just a fantastic time at this rental. We hadn't realized how much the creek would be rushing (I'm sure that depends on time of year and how much snow fell the previous winter), but it felt like we were on a river. Mesmerizing to sit and watch. Finally a rental with a dining room table that seats the number of people it says it can sleep! This is a pet peeve of mine and we had a lovely dinner with all 11 of us (the table seats 12) at one table. Everything was clean and comfortable and we will be back for sure. The house is one of the few we've rented which is perfect for our family for a ski vacation. Each bedroom has a bathroom. The kitchen is big and the dining table can fit a lot of people. The location is also great. We we 6 adults and 6 children. I’m in a wheelchair. We enjoyed our stay. The bed and bath for wheelchair use are on the entry level, so it worked pretty good for me. Sink was high. A few minor problems when we arrived but they were quickly taken care of. Beautiful spot with it being right in the creek. Our family had such an awesome time at this rental. The quiet and scenic location right next to Bear Creek was wonderful - the grandkids had so much fun playing in the creek. It's a beautiful home and furnished well, kitchen well-stocked with supplies, adequate beds and linens. Remember this is a person's home, not a hotel so don't expect luxury soaps or extra towels or perfect furnishings. Like many Alpine meadows homes they are furnished with relics from owners' pasts. The home was clean except for the carpets, which were in dire need of cleaning. The resident vacuum cleaners did not work so we couldn't really keep the floors clean. Also, the outside deck really needed powerwashing - very cobwebb-y. I would give it 4.5 stars if not for these few cleaning issues. Be aware also there are 4 rooms with king-size beds and 1 room with 3 single beds; so only beds for 11, not 13. A couple of the rooms have floor space for a crib or couple of sleeping bags. The upstairs loft is open to below so not private, although there is a screen that helps. Minimum Age Requirement - 25 years old Travel Insurance can be purchased any time BEFORE Final Payment is received. Major Credit Cards Accepted.